Minnesota is the place to be for outdoor adventures and water recreation. After all, it is lovingly nicknamed the Land of 10,000 Lakes. In fact, it has well over 10,000 lakes, and nearly 11,000 of them alone cover 10 acres or more. It’s a beautiful state with one of the highest standards of living in the country. People are happy, friendly, and inviting. Its vast, diverse landscape spans from the Western prairies to the Eastern forests, all teeming with wildlife. The state is also home to a wealth of picturesque campgrounds and RV Parks. So, if you’re hoping to tour the best RV parks in Minnesota, you won’t have to travel far. It’s not just the culture and natural beauty that draw visitors to Minnesota, either. The state is home to a number of oddities and attractions that you’d be hard-pressed to find anywhere else in the United States. Some of the oldest geological formations on the planet can be found in Northeastern Minnesota. The Mall of America in Bloomington, the largest mall in the country, covers a whopping 4.2 million square feet. Both the oldest and the largest theatres are located in Minnesota as well, The Old Log Theater and the Chanhassen Dinner Theater, respectively. Needless to say, if you’re road tripping through the state, you’ll have plenty of roadside attractions to add to your itinerary. If city life is more of your thing, Minnesota has that in abundance as well. The Twin Cities are home to more than 3.8 million people and are rich with urban activity. Despite the cold winters, Twin Cities residents still know how to have fun – The St. Paul Winter Carnival is a giant outdoor carnival that occurs each year. If you’re heading to Minnesota for an RV show, you’d better pack your warmest winter gear, because most of them take place in the winter. Here, we’ll cover the hottest RV shows in one of the nation’s coldest states. The Annual Minnesota Sportsman’s Show takes place at the St. Paul River Centre on the banks of the mighty Mississippi River. The venue is located in St. Paul’s Lowertown district, a popular tourist destination. It’s somewhat of a cultural center and is home to attractions like the Children’s Museum, The Ordway Center for Performing Arts, and a handful of breweries and restaurants. The Mississippi River Recreation Area is just steps away, offering beautiful views and 72 miles of waterfront for outdoor recreation. This popular show is entering its 48th year, and this year is going to be a big one. The show is packed with hundreds of the newest boat and RV models from local dealers. Dozens of representatives from area resorts, camps, and lodges will be at the show, all vying for your business. From camping gear to RV destinations and RVs, you’ll be able to take advantage of exclusive, show-only discounts. But saving money isn’t the only thing this show has to offer – there’s also a ton of family fun, including Twiggy the Water Skiing Squirrel, the Fur-Ever Wild Animal Display, fishing and hunting seminars, and more. Kids can even play games and win prizes! Tickets: $9 for adults, $2.50 for kids ages 6-12, free for kids 5 and under. Discounts: Printable coupon for $2 off one admission. The gorgeous Minneapolis Convention Center hosts this annual show, right in downtown Minneapolis. 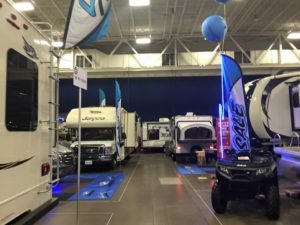 The stately venue boasts the most indoor event space in the Upper Midwest, and they’ll need it for this enormous RV show. If you need a minute to escape the crowds, there are dozens of pubs and restaurants just steps away from the Convention Center. There are also a number of theatres, shops, and cultural attractions nearby. Loring Park is four blocks west of the venue, which also offers a quiet moment alone with the family. This year is the big 50th for the Minneapolis/St. Paul Vacation & Camping Show. It’s the largest show in the Upper Midwest, so be prepared to spend a lot of time browsing! You’ll find RVs of all types from the best dealers in the region, including everything from pop-up campers to motorhomes. 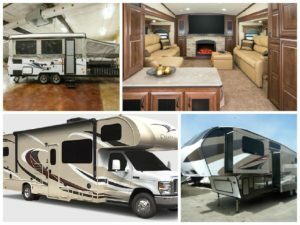 The prices are just as diverse as the RVs themselves, ranging from $4,500 to $600,000 or more! So, whether you want something small and affordable or oversized and luxurious, you’ll have no trouble finding it at this show. Tickets: $12 for adults, free for kids 12 and under. Discounts: Good Sam members get 50% at the door with a valid card. The St. Cloud Sportsmen’s Show takes place at the River’s Edge Convention Center in St. Cloud. As the name implies, the venue lies on the shores of the Mississippi River, making for a scenic backdrop to the show. The Convention Center is lined with floor to ceiling windows and offers sweeping views of both the river and the city beyond. It sits at the head of the tourist district – coffee shops, diners, and bars are all just a short walk down the block. This is the biggest sport show in Central Minnesota and will be celebrating its 30th year in 2018. Though the RV selection may not be as big as some of the other shows, you’ll still find a decent variety of RVs at low prices. This show focuses more on boats and other outdoor lifestyle gear. Aside from hunting and fishing gear, there’s also an array of camping accessories and dozens of resort and lodge representatives standing by. But the real fun is the family attractions, like hunting and fishing displays and seminars, a live trout fishing pond, and the Fur-Ever Wild live animal exhibit. Tickets: $6.50 for adults, $2.50 for kids ages 6-12, free for kids 5 and under. Discounts: Download a printable $1 coupon to show at the door. The Duluth Entertainment Convention Center puts on this outdoor show every year. The Convention Center is located in downtown Duluth’s waterfront district. It’s a beautifully developed area of town that includes the Bayfront Festival Park, the Great Lakes Aquarium, The Lake Superior Railroad Museum, and the North Shore Scenic Railroad. There’s also a casino, a brewery, and several galleries and shops just up the street. The adjacent pier has a number of hotels and inns offering water front lodging and unbeatable panoramic views. If the scenery doesn’t draw you in, the show’s selection of vehicles will. This long-standing show (now entering its 51st year!) boasts a huge variety of boats, RVs, ATVs, camping gear, hunting and fishing lodge information, and more. You’ll be treated to manufacturer incentives and show-only discounts as well. The real star of the show, though, is the entertainment and activities. This year, they’ll have the Mountain Faith Band performing live on stage, creating a vibrant atmosphere while you browse through exhibits of life-sized hunting mounts and play with the British Kennels Labrador puppies. There’s also a ton of activities for kids, including free face painting, fishing, an exhibit of endangered animal species, an indoor slingshot arena, an ATV simulator, and much more. 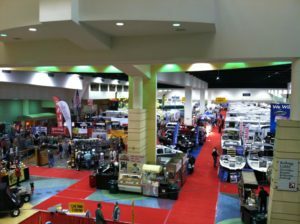 The Duluth Boat, Sports, Travel, & RV Show is certainly one your kids will enjoy! Tickets: $10 for adults, $6 for kids ages 6 to 17, free for kids 5 and under. Discounts: Print this $2 coupon and show it at the door. This show takes place at the Mayo Civic Center in downtown Rochester. The venue is surrounded on three sides by the Fork Zumbro River and the Silver Lake tributary. It’s a lovely exhibition center with plenty of room for a whole host of RVs – and plenty of gorgeous views. The Rochester Theatre Company and the Art Center are both a part of the complex, so you won’t have to travel far if you’re looking for something to do after the RV show. Many hotels, shops, and restaurants are just a few blocks away as well. 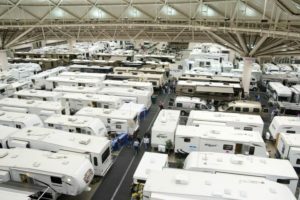 This is an RV-centric show, meaning that every exhibitor is dedicated to all things RVs and camping. You’ll find a huge selection of RVs from top dealers in the area, including travel trailers and fifth wheels, pop up campers, Class C’s, Class B’s, Class A’s, and more. There’s also a large selection of tow vehicles and horse trailers. And, of course, dozens of camping accessories and camping destinations will also be on display. It’s the perfect show to start planning your next big purchase and RV trip! Will You Find Your Dream Vacation in Minnesota? Thousands of opportunities await you in the Land of 10,000 Lakes. Whether you’re on a road trip of the strange and unusual, an outdoor enthusiast looking for your next big adventure, or are on the hunt for a brand-new RV, Minnesota has it all. From the metropolitan region of the Twin Cities to the expansive wilderness of the great northwest, you’ll be able to explore the state’s array of urban culture and natural beauty. Vacationing in Minnesota during the summertime is a must, especially if you’re in an RV. If it’s still wintertime, though, don’t worry – just head to one of the state’s many RV shows to start dreaming up your next vacation! 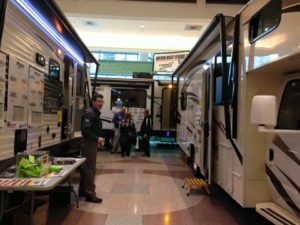 While most people go to RV shows to browse, many go to make a purchase. RV shows offer special deals and low pricing that can rarely be found elsewhere. However, the energy of a short-lived RV show tends to create a sense of urgency, leading many people to make hasty purchases. Here at RVshare, we can’t stress enough how important it is to do your research before buying an RV. A great way to do that is to rent one for a week or two as you’re planning your purchase. It’s helpful if you’re on the fence about a certain type of RV or if you’re new to the lifestyle and want to make sure it’s right for you. Check out our inventory of RV rentals in Minnesota if you’re interested! Happy camping!